A very Japanese and very cool way to study new Kanji. 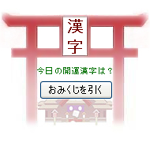 Click on the middle "おみくじを引く” button and see what Kanji appears. Created for Japanese, so you know you'll be learning the real thing.